Things often look better from a distance. In this photo one begins to understand why several attempts were made to remove this bridge. It looks a little flimsy and it's not very clean. Also, It doesn't make a particularly graceful transition from the river to the bank. The concrete pier and ramp leading to the Left Bank look like an afterthought, and despite some lovely art nouveau details, it appears to have seen better days. I've noticed that pedestrian bridges across the Seine are provided with a wooden deck. They don't seem to age very well and this one seems to have become waterlogged and it's growing grasses along its edges. I wonder why a rubber or asphalt surface isn't used for the deck? 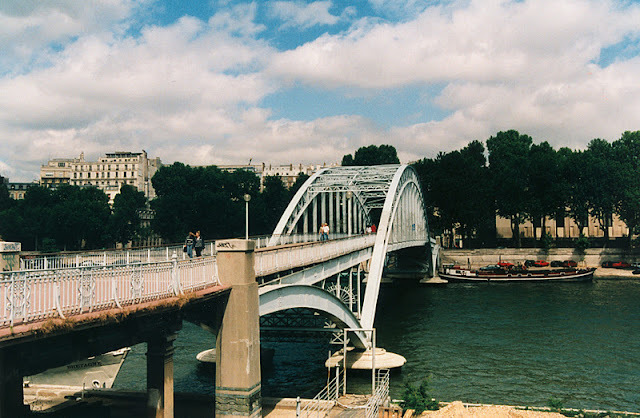 This bridge has none of the elegance of the nearby Pont Alexander III even though it was designed by the same engineer. Perhaps it suffered from its move upstream after the World's Fair. Still it appears to be a very popular bridge with attractive views for pedestrians crossing the Seine. Seine River Bridges: Passerelle Debilly (2) by Mark Yashinsky is licensed under a Creative Commons Attribution-NonCommercial-ShareAlike 3.0 United States License.